We are just a week away from Kingsman 2 finally arriving in theaters. Fox has done a pretty great job of not showing off too much from the highly-anticipated sequel, but still giving us more than enough to get excited. Now, a brand new promo has arrived online that highlights Julianne Moore's villain in addition to a whole bunch of crazy footage. This new sneak peek at Kingsman: The Golden Circle comes to us courtesy of The Ellen Show, which isn't overly long, clocking in at just over a minute, but it packs a serious punch. Julianne Moore's character, Poppy Adams, has been somewhat absent from the previous trailers, but she is put front-and-center here. To say the least, it looks like she is going to be totally nefarious and brutal. As the head of the corporation known as The Golden Circle, she bares similarities to Samuel L. Jackson's character from the first Kingsman. However, he couldn't stand violence and she seems to truly enjoy it. In addition to seeing some more Poppy and getting a better sense for what Eggsy and the gang are going to be dealing with in Kingsman: The Golden Circle, we get to see some absolutely, delightfully insane bits of footage. 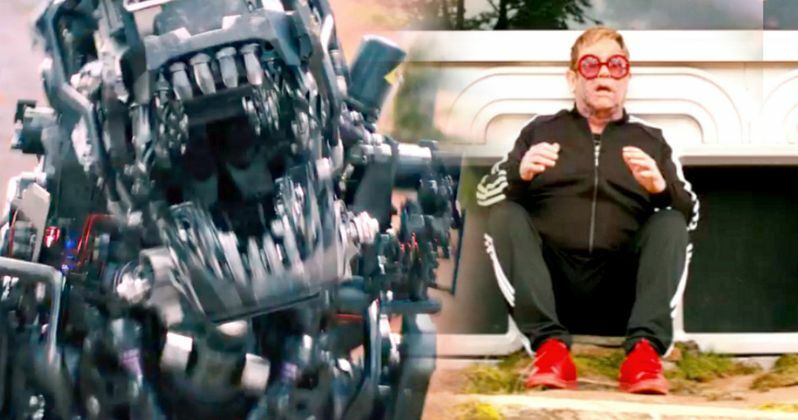 There are some evil robot dogs, our first, very brief look at Elton John's character and Channing Tatum dancing in a unitard and cowboy boots to The Safety Dance. That's something many people probably thought they'd never see, but it's happening. The only unfortunate side effect? You will probably have The Safety Dance stuck in your head after watching the video. Kingsman: The Golden Circle sees director Matthew Vaughn back at the helm, with returning cast members Taron Egerton, Mark Strong, Sophie Cookson and Colin Firth. There have also been some new additions in the form of the aforementioned Channing Tatum and Julianne Moore, as well as Jeff Bridges and Halle Berry. The movie is set for release on September 22, which will put it up against The LEGO Ninjago Movie. However, Kingsman 2 is expected to win the weekend with a take of $40 million or more. That'll make for a nice start at the box office and bodes well for those who hope to see Kingsman 3 happen. Matthew Vaughn surprised us all with Kingsman: The Secret Service in 2104, which wound up being a bit of a sneaky hit that year, bringing in $414 million worldwide. Beyond the financial success, the first movie was received very well by both fans and critics. Reviews haven't yet arrived for Kingsman 2, but if they're as positive, Fox could have a huge hit on their hands. The movie has also found a pretty sizeable audience in the years since its release, so it is very conceivable that the sequel could best its predecessor. Be sure to check out the brand new promo for Kingsman 2 for yourself below.